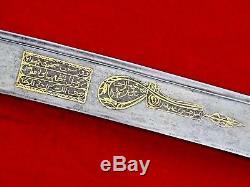 MAGNIFICENT ANTIQUE ISLAMIC SWORD - YATAGHAN. GORGEOUS WEAPON, DEFINITELY INDICATOR OF WEALTH AND HIGH SOCIAL STATUS. TURKISH OTTOMAN, CIRCA EARLY 19TH CENTURY - ABOUT 200 YEARS OLD. 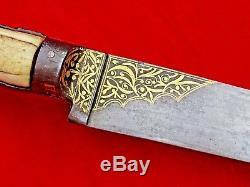 EXTENSIVE GOLD DECORATION ON BOTH SIDES OF THE BLADE - STUNNING CRISP DETAILS. 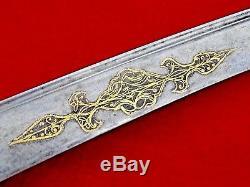 UNUSUAL IRON BACKSTRAP WITH TRACES OF GOLD DECORATION. 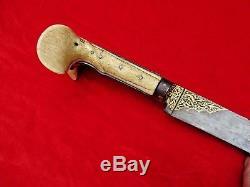 TOP QUALITY HAND FORGED BLADE WITH SUPERB GOLD KOFTGARI DECORATION AND GOLD ARABIC CALLIGRAPHY. 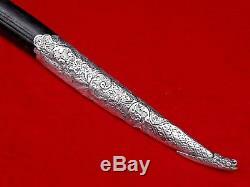 ORIGINAL LEATHER OVER WOOD SCABBARD WITH SILVER (or silver-plated) FITTINGS. 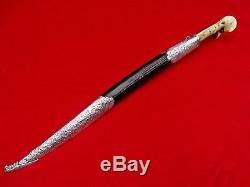 (72 cm) LONG IN THE SCABBARD. 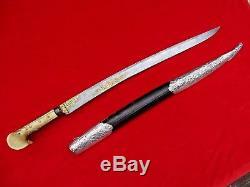 (70.5 cm) LONG OUT OF SCABBARD. BLADE IS ABOUT 22 in. 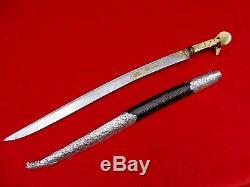 SWORD IS IN VERY GOOD ORIGINAL ANTIQUE CONDITION. 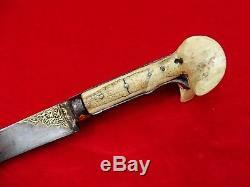 GOLD KOFTGARI DECORATION ON BLADE IS NEAR 99% CONDITION. SOME LIGHT SHARPENING MARKS AND VERY MINOR DARK SPOTS ON BLADE. 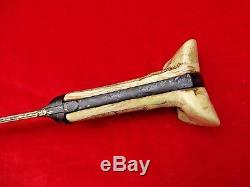 BONE GRIP WITH LARGE "EARS" IS SOLID, SHOWS NORMAL STABLE AGE CRACKS AND AGE WEAR. ORIGINAL LEATHER ON SCABBARD IS VERY GOOD, SHOWS SOME AGE WEAR, ORIGINAL FITTINGS ARE DENTED. NOTICEABLE WEAR TO GOLD DECORATION ON IRON BOLSTERS, TRACES OF GOLD DECORATION ON IRON BACKSTRAP. SUPER FINE QUALITY EXAMPLE - PICTURES DON'T DO JUSTICE - ABSOLUTELY STUNNING! Your satisfaction is very important to us. Items must be in their original condition with similar of our packing. Although every effort is made to ensure accurate dimensions and weights, the figures shown should always be treated as approximate. The pictures should be considered as part of the item description. We do not take responsibility for any personal or third party losses. 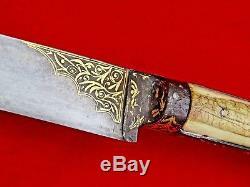 The item "ANTIQUE ISLAMIC SWORD YATAGHAN TURKISH OTTOMAN GOLD SILVER dagger knife blade" is in sale since Monday, June 4, 2018. 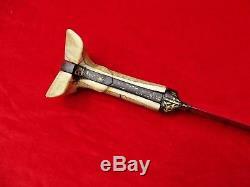 This item is in the category "Collectibles\Knives, Swords & Blades\Swords & Sabers\Middle Eastern". The seller is "silverapple" and is located in PA.